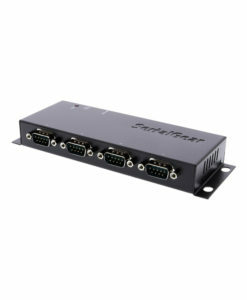 The USB-4COMi-SI-M Serial Adapter instantly adds four RS-422, or RS-485 serial communication ports to your system while offering optical isolation and surge protection. Optically Isolates your RS-422 and RS-485 serial ports. Incorporates DIP Switch control for independent control of serial signal to the port. Has built-in surge and ESD protection of up to 25KV when abnormal electrical occurrences occur. Self-powered, one switching power adapter of 5V, 2A provided. The USB-4COMi-SI-M is a USB to Quad RS-422 485 Optical isolated serial adapter and is designed for commercial and industrial communication applications where Optical Isolation is a must have. Serial RS-422 or RS-485 port expansion is made simple with the USB-4COMi-SI-M by connecting to a host USB port on your computer or USB hub for Plug-and-Play installation and automatic serial device detection. The USB to Quad RS-422 485 does not require additional IRQ or DMA configuration so it does not use memory as a resource on the system, therefore there are no conflicts. The adapter is self-powered, and one power supply adapter of 6V/2.1 Amp is included. The adapter is designed with a four external 4-pin dip switches (pictured below) to set RS-422 or RS-485 mode conveniently, without the need to open the metal chassis. Each port can be independently set to RS-422 or to RS-485, depending on your requirement in application. The USB-4COMi-SI-M USB to Quad RS-422 adapter has a built-in surge protector to withstand electrostatic discharges and power surges up to 25KV ESD. The USB to RS-422/485 Adapter provides instant connectivity to RS-422 or RS-485 communication devices for POS, factory automation equipment, multi-drop data collection devices, bar code readers, time clocks, scales, data entry terminals, PC to PC long distance communications, ATMs and serial data communication in harsh environments. The adapter’s USB to Industrial I/O provides industrial solution requiring single node or multi-drop communications over short and long distance. IEC 61000-4-6, IEC 61000-4-8, IEC 61000-4-11. CISPR PUB. 22 and FCC Part 15 Class B. The 4 port USB to RS422/485 isolated serial adapter has certain accessories that work with it. These accessories are what you can order if needed. Did you misplace or break a part that came with your 4 port serial adapter? Purchase it here!